Gah, we hate it when it’s our turn to pick the winner of a challenge because it’s always such an impossible task! Last month for our bathroom challenge, you seriously wowed us with your beautiful bathroom styling! And we just loved seeing some of your latest bathroom renos too, major heart eyes!! But, we weren’t challenging you to share the most beautiful bathroom rather your styling in the space – after all, these challenges are about making the most of what you’ve got and tackling one room of your home at a time to create a stylish home you love. So while we had to pick our jaws off the ground more than a few times (@allthingsrosy_ we’re looking at you! ), we ultimately picked @battenfiles as the winner! 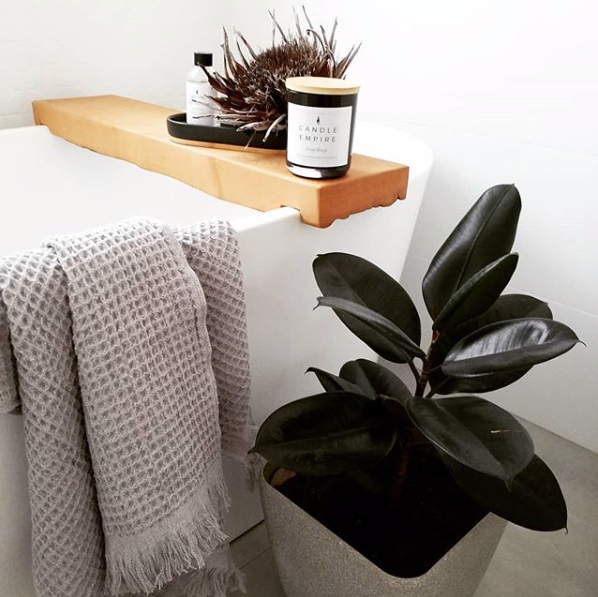 We love how she combined natural and raw materials like the dried Protea flower with more polished pieces, and a showed you don’t have to spend a fortune to create a beautiful space (that pot plant is from Bunnings and towels from Kmart). Congratulations on winning! Don’t forget to join in this month’s challenge — to show us your nursery or kid’s room styling for a chance to win a beautiful prize pack from Home Love Interiors! Find all the details to join in our April challenge here.